Tourists, school kids, commuters and Halloween enthusiasts in lower Manhattan barely knew about a terrorist attack Tuesday afternoon just after 3 p.m., right before school let out on halloween night. By 6 p.m. a table of women imbibed happy hour drinks on the 20th floor of the Club Quarters Hotel on Washington Street. A couple took a picture with a selfie stick in front of the World Trade Center in Liberty Park. A man with a painted face trying to raise money for UNICEF on Broadway made ghoulish noises at passersby. Workers leaving the workday at companies like American Express rushed out of Brookfield Place, not in fear of radical Islam terrorism. Rather, many were carrying shopping bags and heading home for Halloween festivities. All of them were blocks from the worst terrorist attack New York City has seen since Sept. 11, a crime scene that stretched for nearly a mile with a driver heading along a tree-lined bike path toward the World Trade Center, smashing into unsuspecting bicyclists and pedestrians. People went about their night as if nothing has happened. “I wasn’t there,” said a boy with a string backpack, who stood near the bike path. According to early police and media reports, eight people were killed, and 11 people were injured. The police have identified Sayfullo Saipov, 29, as the man who drove a pickup truck (rented from a Home Depot in New Jersey and bearing the message “Rent me for $19”) down a crowded bike path along the Hudson River and West Side Highway in Battery Park City. He crashed the truck into a school bus that served special needs students, injuring two adults and two children. Saipov proceeded to get out of the truck, waving a paintball and a pellet gun and yelling until he was shot down by the police. “Just two blocks away,” said a man working at 200 West Street, pointing North, before returning to a conversation with his coworker. On the corners of Murray and West Streets, news reporters were setting up to broadcast what happened. A man wearing a black scarf with white skulls saw what happened and waited to speak on camera. He grinned as he asked the woman standing near him with two shopping bags to take a picture of him, as he was about to appear on live television. “Just talked to Bond,” said one print journalist into a cell phone. “He’s giving an address in New Jersey.” Later that evening, news reports indicated Saipov, a native from Uzbekistan who moved to New York in 2010 with a green card, lived in Paterson, N.J., and Tampa, Fla. The terrorist was driving south toward the 9/11 Museum and Memorial when his rampage was stopped just outside the Stuyvesant High School, one of the most elite public high schools in the New York Public School System. It’s ranked as one of the top high schools in New York State and in the nation according to U.S. News and World Reports. Stuyvesant teachers pointed students toward safe routes to get home. Students shuffled past, some wearing Halloween costumes: One dressed as Alice in Wonderland; another as nondescript superhero; another dressed as a cow; another dressed as a giraffe; another, in a minimalist costume, wore a pumpkin tie. People continued to walk by, New Yorkers in jeans, New Yorkers in wheelchairs, New Yorkers in headscarves. They stare at their cellphones. They push their kids along in strollers. Some stop to take a picture of the crime tape and the ambulances. Most continue on as if nothing has happened. “Turn right. Go on to Vessey,” said a man in a cowboy hat and jeans with a walkie talkie, trying to direct the people to turn South of the scene. Most people ignored him. Roughly 21 individuals have been charged with or died engaging in jihadist terrorism or related activities in the United States in 2017. And the frequency of vehicles in attacks has picked up in the last year after pedestrians were killed by jihadists using vehicles as weapons in Nice, France; Berlin, Germany; London; Barcelona and, now, New York City. Terrorist magazines such as Rumiyah, an ISIS magazine, called for attackers to mow down pedestrians with trucks and then continue attacks with a knife or gun while shouting and spreading Radical Islamic literature. 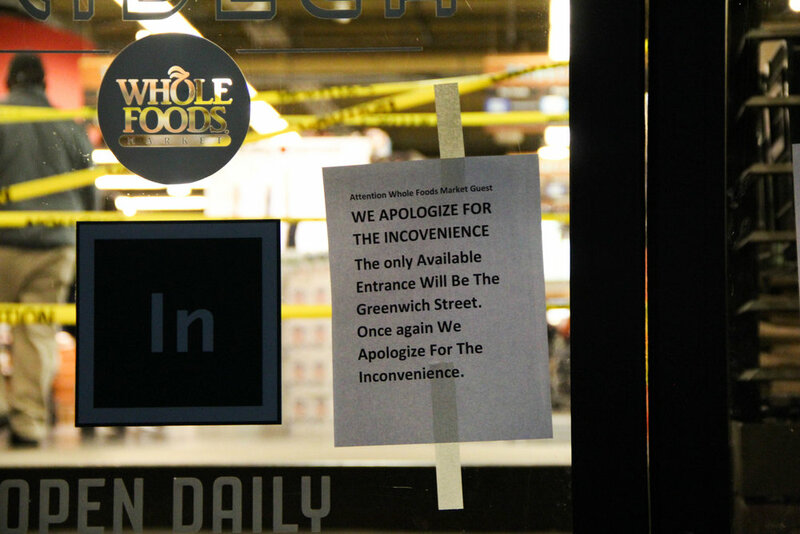 The Whole Foods on Greenwich Street closed its entrance on Warren Street. “What happened in Battery Park?” asked an employee at the Bed, Bath & Beyond on Greenwich and Warren Street. “Oh that? Yeah, I just heard the news.” She continued pushing a cart through the store. Even as push alerts from cell phones beeped updates about the attacks on Tuesday afternoon, New Yorkers possessed a rare calm. Unlike the attacks of 9/11 that shook and shocked an entire city and nation, New Yorkers seemed unfazed, unbeaten and resilient within minutes of this attack. Religious Freedom and Anti-Semitism: Is Europe Disconnected from Faith?